It was through St. Armand West (Philipsburg) that the first ministers of the Protestant churches arrived in the Eastern Township from the United States. First Baptists, then Methodists, and then the Church of England spread their messages to the new communities. Many of the early German Loyalist settlers in this area, who came from the Mohawk Valley in New York, had known John Wesley in Ireland and been converted to Methodism. They formed a strong Methodist base, and included local settlers such as Loyalist Peter Miller and Garret Sixby. The first Methodist meeting in the Parish of St. Armand was recorded as a quarterly meeting held at Philipsburg on September 20, 1806. Brother Francis Bacon, who was “Licensed to preach”, and Brother Micah Townsend, who was “licensed to exhort”, formed this congregation. The presiding elder at this first meeting was the Rev. Henry Eames from the U.S., and the preacher was the Rev. Reuben Harris. There is a break in the records during the War of 1812-14, but the Methodists resurfaced in 1818 with a new British Wesleyan minister, the Rev. Richard Pope, arriving on the scene. 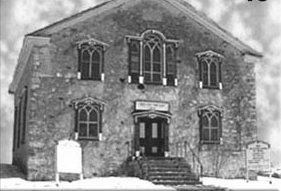 The meeting, as the Methodist religious services were called, were held in schoolhouses or homes until a church was built at Philipsburg in 1819. 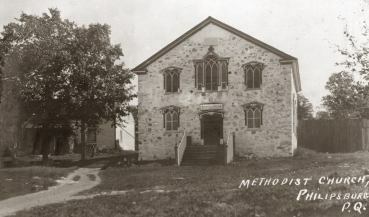 This was the First Methodist church in the Eastern Townships. Philip Ruiter and James Taylor deeded land for the church on October 7, 1819 for the Board of Trustees. The foundation stone was laid on July 20, 1819. The architecture of the Philipsburg church reflects the influence of the German Palatine Loyalists and their expertise in stonework. As was typical of Methodist practice, preachers changed often, never remaining long in one church. In 1837-38, during the Patriot uprising, some excitement occurred when the Methodist church was barricaded as an emergency arsenal. Volunteers for the government side, returning from the battle at Moore’s Corners, (St. Armand Station), found that the people, under the direction of the Rev. William Squire, had prepared large amounts of salt pork and potatoes in iron kettles to feed those militiamen who had not eaten in many hours.